At least 465 people were injured, Catalan officials said. Spain’s constitutional crisis reached a boiling point as Catalans in Barcelona and across the region headed to the polls in a highly contested independence referendum and were met with a harsh police crackdown. Several hundred people were injured in the confrontations with officers on Sunday, and dozens of polling centers were shut down. Police acting on orders from the Spanish government to stop the voting across the country’s northeastern region clashed with Catalans who were attempting to stop them from confiscating ballots. Videos that emerged Sunday on social media appear to show police using brutal force on people attempting to cast their vote. Catalonia’s health service said Sunday night that at least 844 people were injured today by the evening -- nearly half of them in the Barcelona region, where police fired rubber bullets near at least one polling station, according to The Associated Press. Spanish authorities said 11 police officers were injured in the melees. On Sunday, Spain's Deputy Prime Minister Soraya Saenz de Santamaria praised police in the region for acting with "firmness and proportionality." Spain’s government has said that the referendum is illegal, and the country’s Constitutional Court in early September ordered the planned vote suspended. Catalan separatists called on millions of registered voters to defy these orders and head to the polls on Sunday anyway. Raul Romeva, Catalonia’s international affairs director, said that regional leaders will appeal to European authorities regarding alleged human rights violations witnessed today, the AP reports. Spanish Prime Minister Mariano Rajoy gave a defiant speech on TV Sunday evening blaming Catalan leaders for the chaos. “The leaders of Generalitat Catalunya Government [the Catalonia regional government] pretended to get rid of the rights of Spanish people with the violation of the law. They are the responsible ones,” Rajoy said. Spain’s interior ministry said today that, as of 5 p.m. local time on Sunday, 92 polling centers had been shut down by national police or other authorities. Catalan leaders on a stage in Barcelona’s Plaza Catalunya said they will not have their dignity taken through authoritarian means, and announced a general strike in the region for Tuesday, with mobilization in the streets. The president of the separatist group Omnium Cultural, Jordi Cuixart, blamed today’s violence directly on Rajoy and Interior Minister Juan Ignacio Zoido, the AP reported. Turull said the actions of Spanish police and the nation's civil guard were politically motivated, and showed "a clear motivation to harm citizens." 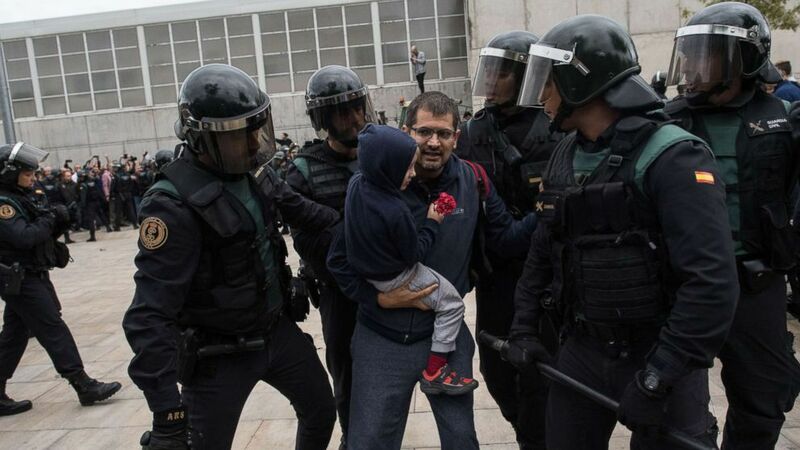 (David Ramos/Getty Images) A man and a child holding a red flower run from the police as they move in on the crowds, as members of the public gather outside, to prevent them from stopping the opening and the intended voting in the referendum at a polling station where the Catalonia President Carles Puigdemont will vote later today, Oct. 1, 2017 in Sant Julia de Ramis, Spain. At a rally in Barcelona last week, Cuixart had announced that ballots in the contested vote were going to be distributed across the region. Since that distribution began, police have confiscated millions of ballots and arrested approximately a dozen regional Catalan officials, according to the AP. One native Catalan, Albert Marti, told ABC News he returned to Barcelona from Munich to participate in the vote. He said his mother is from Spain and his father is Catalan, and that his vote in favor of independence reflects his feelings from having grown up in the region. "For me it's above everything for our right to have our own culture, and not to be absorbed by Spain,” he said. “This is what they are doing for the last years." "I am an independent because I am afraid of the dictatorship,” she said. “Catalan people have always been pacifist." ABC News’ Aïcha El Hammar contributed to this report.